His Eminence Sergios (Abad) of Santiago is the ruling bishop of the Antiochian Orthodox Archdiocese of Santiago and All Chile which is under the jurisdiction of the Church of Antioch. 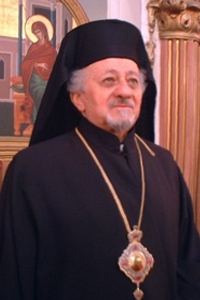 Archbishop Sergios began his theological education at the Seminary of Balamand in Lebanon and continued at the Theological School of Halki under the Church of Constantinople. He was ordained a deacon by Metropolitan Elias (Mahouad) of Aleppo followed by ordination to the priesthood. He was elevated to the rank of archimandrite by Metropolitan Theodosios (Abu-rejaile) of Tripoli. From 1956 to 1961, he served as the rector of the seminary of Balamand. From 1962 to 1967, he was given the task of establishing a presence and serving the Church of Antioch in Kuwait. From 1968 until 1975, he served as the episcopal vicar in Brazil and established and led the Orthodox congregations in Venezuela. On December 4, 1988, he was consecrated a Bishop in Santiago, Chile and was appointed the patriarchal vicar for Chile. In 1996, the vicariate of Chile was raised to the status of a metropolis. On October 8, 1996, Bishop Sergios was elected Metropolitan of Chile as the ruling hierarch of the new Archdiocese of Santiago and All Chile. This page was last edited on October 4, 2015, at 14:49.